THEODORE ROOSEVELT. 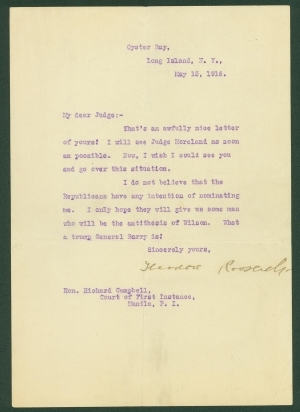 Typed Letter Signed, to Judge Richard Campbell of the Philippines, May 13, 1916, Oyster Bay, Long Island, N.Y. 1 p., 7 x 10 in. That’s an awfully nice letter of yours! I will see Judge Moreland as soon as possible. Now, I wish I could see you and go over this situation. I do not believe that the Republicans have any intention of nominating me. I only hope they will give us some man who will be the antithesis of Wilson. What a trump General Barry is! Thomas Henry Barry (1855-1919) was a U.S. Army general, whom President Roosevelt had earlier appointed as commander of the Army of Cuban Occupation and Pacification and who had also served as Superintendent of West Point from 1910 to 1912. At the time of this letter, he was the commander of American troops in the Philippines and China. The central issue in the 1916 presidential election was the looming prospect of American involvement in the war in Europe. To no one’s surprise, the Democrats nominated incumbent Woodrow Wilson, while the Republicans nominated Charles Evans Hughes of New York, then a sitting associate justice on the Supreme Court. Regrouping after the disastrous result of Roosevelt’s “spoiler” candidacy in 1912, the Progressive Party nominated him once more. Roosevelt, his disdain for Wilson even greater than before, and all too aware of the consequences of another split Republican vote, withdrew his candidacy and threw his support behind Hughes. Roosevelt was an anglophile and a muscular nationalist, and favored immediate American intervention in Europe on the side of Britain and France. Ironically, Wilson campaigned on the slogan, “he kept us out of war,” but moved the nation towards a declaration of war against Germany a year later. In 1916, Wilson defeated Hughes in one of the closest elections in American history, winning by twenty-three electoral votes and about 600,000 popular votes out of over 18 million votes cast.